Love the colors as well as the peace and serenity of the frog. It looks like the most peaceful being on earth. Btw, Mark, are you on Instagram? Can’t remember if I asked you that though if I did I think I’d be following you on there by now. At peace in a wild world, a remarkable state to be. No instagram, this WP blog is enough for me, for now. Lustrous colors and lines that want to be drawn. Naturally, by nature. He didn’t have to work at it, instinctively. Except to survive. Well … it’s the way it is with purpose. Without self reflection there is no knowing ones self, and ones more refined nature, no potential for improvement. But nature, as the frog is – being without being anything in particular, serves to remind of that state. A kind of sign post if you like, it serves most those engaged in the process. Frog doesn’t think. monkey think frog look little bit buddha-like. Buddha realised the state of frog. Buddha is a little frog-like. What a little beauty :) So calm and sleek. On my desktop to enjoy a bit more. What a brilliant creature, and the contrast with the red is beautiful. Nice capture, as always, Mark. So beautiful…thank you for sharing this quietly contemplative little creature…just wonderful. 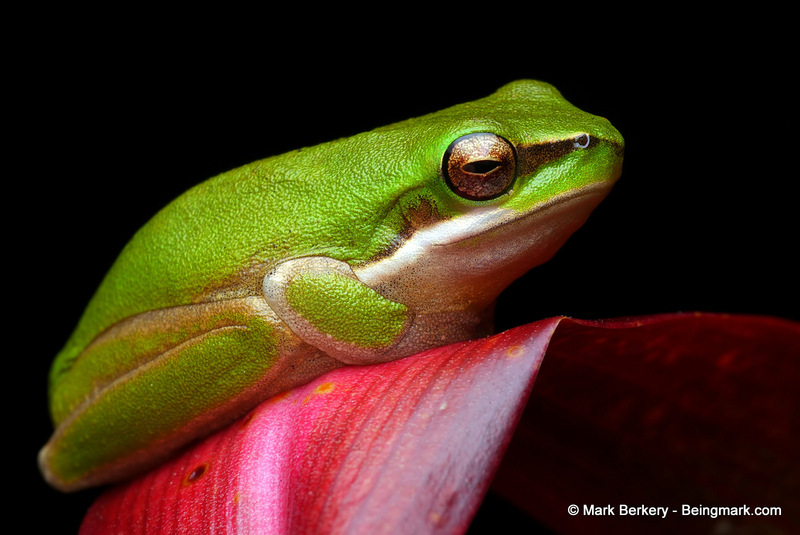 Beautiful textures and colours and there always seem to be some aura of wisdom around a tree frog. The clarity in the eye … no clutter of mind reflected.